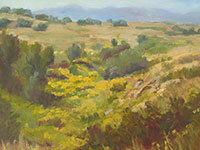 Jerry is an established oil painter from Colorado Springs. She was raised on a ranch near the Spanish Speaks in Southern Colorado and has always loved the outdoors and appreciated its great beauty. Painting is a way for her to show her emotions she feels for nature. In the late 90’s she began lessons with Barbara Bartels, and instructor from Colorado Springs, who later moved to Taos New Mexico to pursue her career. Jerry has taken classes through the years from artists in the area including Chris Alvarez, Dan Shultz, Laura Reilly, and Martha Mans, and was a member of the Cottonwood Art Gallery. She has studied under Chuck Mardosz for many years and continues to do so. 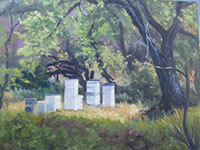 Landscapes, floral, and wildlife all provide subjects for her paintings. 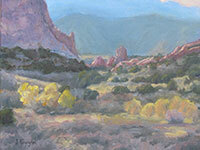 She is a member of the Colorado Springs Art Guild. She hopes to inspire viewers by portraying God’s beauty through her paintings. Her paintings have sold to collectors from the East to the West Coast. Click each thumbnail to see an enlargement of the painting. Copyright © 2000-2009 by Arati Artist Gallery All Rights Reserved.